Right now you could be wasting up to 40% of all the energy consumed within a business. Does Your Power Factor Need Correcting? 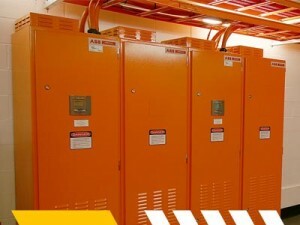 Power Factor Correction (PFC) is a measure of how effectively incoming power is being used in your business and is defined as the ratio of real (working) power to apparent (total) power. If your power factor is low, you may be paying more than you need to for your electricity. If you are regularly registering less than 0.9, you have a low power factor and have reason for concern. It is a network regulation that customers maintain a minimum Power Factor of 0.9 and from 1 July 2015, certain authorities will be charging larger customers demand tariffs based on Apparent and not True Power usage. Find out how Brimar can assist with Power Factor Correction? Brimar provides a fully integrated range of Energy Management Services, including Power Factor Correction to address the requirements of industrial processing and manufacturing plants, commercial buildings and shopping centres. Our Energy Management Services include initial customer engagement and assessment, design, project management, installation, commissioning through to ongoing operations and technical support of market leading energy improvement initiatives.